Toad doesn't get the credit he deserves. He helpfully points you in the right direction whenever the princess is in another castle. His small size is an aerodynamic advantage when you plop him in a go-kart. And he was always willing to give you items in Super Mario 3D World, even after you thanked him with a fireball to the face. Now, Toad's distant relative, Captain Toad, has taken off on an adventure of his own. While Mario and company were off fighting Bowser in 3D World, Captain Toad starred in a series of unique puzzle levels that stood out thanks to their compact size and laid-back pacing. These levels made such a strong impression that they landed him a starring role in Captain Toad: Treasure Tracker, a fully fledged spin-off release for the Wii U. While I wondered if Captain Toad's limited capabilities and the small scale of his adventures could support a full retail release, Treasure Tracker emerges as a pleasant surprise. It fully explores its limited scope, and offers a satisfying quest in its own right. 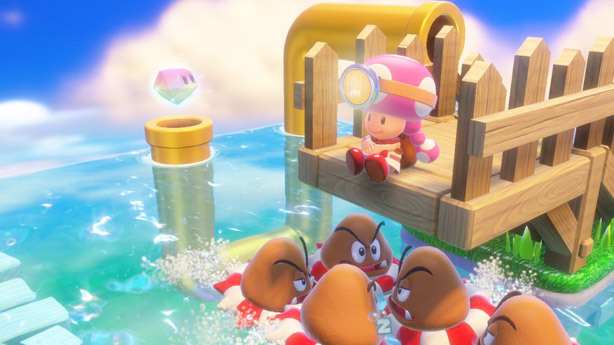 In Treasure Tracker, Captain Toad explores dozens of levels filled with tricky platforms, deadly traps, and staple enemy characters plucked from throughout the Mario series. Each stage is presented as a diorama-like 3D model that you can rotate using the Wii U gamepad's gyroscope or right analog stick. Finding the best angle of approach is often the key to reaching the golden stars that mark the end of every level. If you were controlling Mario, you could clear most levels in Treasure Tracker with a jump or two. As Captain Toad, you're not only unable to jump – you can barely even run. Solving each level requires forging a safe path that minimizes enemy encounters while keeping Toad out of harm's way. It's an interesting formula – it makes you reconsider standard platformer structure, as the starring character's role is more passive than in similar games. Captain Toad has expanded his repertoire a bit since Super Mario 3D World. He can now climb ladders, flip switches, and pluck turnips from the ground and throw them at enemies. You'll also occasionally find pickaxes that temporarily turn Toad into an unstoppable killing machine who can mow down breakable walls and Shy Guys alike. It's kind of brutal. Meanwhile, Wii U gamepad-specific mechanics add depth to Treasure Tracker's campaign. Some levels require spinning a knob overlay on the Wii U gamepad's screen to rotate obstacles and uncover secrets. Other stages feature platforms that move when tapped on the touchscreen, requiring a Pushmo-like mix of dexterity and brainpower to navigate. Treasure Tracker aptly fleshes out the clever but limited gameplay concepts introduced in Super Mario 3D World's Toad levels. None of its included puzzles are particularly taxing, but there's a certain satisfaction in discovering a well-hidden passageway or sussing out a path to a deviously placed gem after several minutes of camera-spinning. Treasure Tracker won't overwhelm you with challenge, but it remains a joy throughout thanks to its skilled level design and varied mechanics. When it comes to structure, Captain Toad keeps it simple. Story sequences are infrequent, wordless, and brief, and mostly serve to bridge different level types. The majority of stages are puzzle-oriented, but occasional minecart sequences and boss battles keep the pacing solid. The auto-scrolling minecart levels are fun breaks from the action, letting you bombard enemies with endless volleys of turnips in a cathartic rage. Bosses really highlight Captain Toad's specific weaknesses, however, and require clever use of his limited skillset in order to survive. Treasure Tracker's core quest is fairly short (my playthrough clocked in at under six hours), but there's enough optional content to keep you busy for hours more. Each level features a bonus objective that's revealed after finishing it for the first time – you might have to find a hidden golden mushroom, avoid taking damage, or collect a certain number of coins before reaching the exit, for instance. Some of these objectives are surprisingly challenging, and they ensure that you'll plumb Treasure Tracker's levels and mechanics to their fullest. You'll have ample incentive to explore every nook, too. Treasure Tracker rewards completionists with reimagined levels from Super Mario 3D World, retrofitted with Toad-friendly alterations and remixed layouts. These are fun if you've put a lot of time into 3D World, as they make you carefully reconsider the path you'd take through familiar terrain thanks to Toad's inability to jump. I'd initially judged Treasure Tracker as a pleasant but temporary distraction, but I continued playing even after I'd completed every level, and I'm still working on rounding up the collectibles I missed the first time around. Treasure Tracker may be small in stature, but it's packed with depth and detail. It's not unlike Toad himself, really. He's a little guy, but he'll surprise you. After all, he's the best. This review is based on an eShop download of Captain Toad's Treasure Tracker, provided by Nintendo. Images: Nintendo.